Are you looking for practical, cutting-edge information on ways to help educate your child? Read about the profound principles of the Education of the Heart: Montessori education and brain development, as well as innovative ways to activate your child’s creative right brain. How can meditation build healthy babies? Gemstones have a molecular structure that allows them to carry a certain charge and energy vibration that corresponds to particular qualities of God. For example, rose quartz holds the vibration of love, and emeralds hold the vibration of healing. 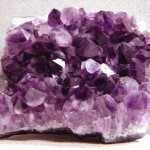 Amethyst is the transmitter of freedom and joy. You can also include in your meditation book pictures of flowers, nature scenes, angels and nature spirits, classical art and illustrations of the madonna and child. How does meditation on beautiful classical music and art enhance the baby’s potential? The years from conception through age seven are the most creative period of the child's entire life. It is during this period that the intricate patterns of the soul and the four bodies of the child are established. To assist in the building of these intricate patterns, there is nothing that can replace meditation on the best classical music and art. The unborn baby is profoundly sensitive and can perceive the beauty, virtue and joy that the mother sees and feels as she meditates upon beautiful works of art by masters such as Michelangelo, Leonardo da Vinci and Nicholas Roerich. As the mother meditates, the baby also learns to meditate, filling his consciousness with light and beauty. Therefore, keep perfect archetypes — perfect geometric forms, nature scenes, classical art — before the vision of the child. You are teaching your baby to meditate from the hour of conception. When the baby hears and feels divinely inspired music, his consciousness and the very atoms, cells and electrons of his four bodies will vibrate and coalesce around the patterns of this music. Much of my pregnancy was spent with a choir recording an album of devotional songs to the Blessed Virgin. My daughter now sings like a bird! She even sings like a trained singer–her pitch is right on and she holds the vowels a long time before singing the end consonant. And she loves the songs on the album! About a month before my daughter's birth, my husband found a stack of books on the arts and ballet. One book from the 1940s particularly stood out. It had beautiful pictures of Russian ballerinas and I meditated on them. When my daughter was only one week old, I had a dream in which she was two or three years old. She said to me, “I'm a dancer, you know.” Now at six, she really is a dancer. Recently she composed and then performed a Buddhic dance. I feel her mission is in the creative arts. Meditation upon the best classical music influences virtually every mental, emotional and physical process ~ and especially impacts the harmony of the emotional body. Music is also an expression of beauty, and beauty is a universal medicine. Health and beauty are intimately related. You can meditate on perfect colors of the seven rays and the five secret rays, (starting with the colors of the threefold flame – pink, blue and yellow) on beautiful classical music, on lovely art – paintings and sculptures, on perfect geometric shapes that are in fact the building blocks of life. As you meditate on these during pregnancy you are instilling these patterns into your child soul and four bodies. Once your child is born, these focuses can be where she sees them every day and sees and hears the meditations.